The investigating judge in the case of the Iraqi journalist who threw shoes at President Bush says the man shows signs of being beaten. Judge Dhia al-Kinani said Friday that the journalist had bruises on his face and around his eyes. 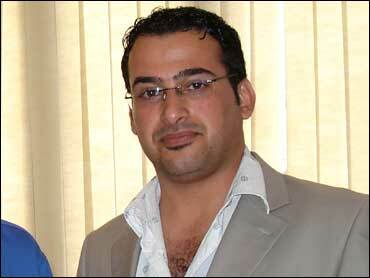 The journalist, Muntader al-Zeidi, was wrestled to the ground after throwing the shoes during a Sunday news conference with Mr. Bush and Iraqi Prime Minister Nouri al-Maliki. CBS News Baghdad producer Randall Joyce says al-Zeidi has been kept completely out of the reach of his legal representation and his family since the show-throwing incident late on Sunday - a fact which typifies a deeply flawed Iraqi justice system. The judge said Friday the journalist has not raised a formal charge relating to his injuries. He also confirmed that al-Zeidi had written a letter to al-Maliki requesting a pardon. One of al-Maliki's spokesmen said Thursday that al-Zeidi had begged for a pardon for what he described as "an ugly act" in the letter, first reported by Joyce in a story for CBSNews.com's World Watch. Al-Zeidi, a correspondent for an Iraqi-owned television station based in Cairo, Egypt, could face imprisonment for either insulting, or assaulting a foreign leader. He remained in custody Friday. "It is too late to reverse the big and ugly act that I perpetrated," al-Zeidi wrote in the letter delivered to al-Maliki, according to the prime minister's spokesman. The spokesman, Yassin Majid, told The Associated Press that al-Zeidi went on in the letter to recall an interview he conducted with the prime minister in 2005 when al-Maliki invited him into his home, saying: "Come in, it is your home too." "So I ask for your pardon, Excellency," Majid quoted the letter as saying. However, the journalist's brother, Dhargham al-Zeidi, told the AP he was skeptical that his brother would write such a letter. "I am suspicious that my brother wrote that letter to al-Maliki because I know my brother very well," he said. White House press secretary Dana Perino said Thursday that she'd seen reports that al-Zeidi had apologized but that she did not know whether Mr. Bush was aware of them. "The president harbors no hard feelings about it, and the Iraqis have a process that they'll follow," Perino said. "But he did urge them not to overreact, because he was not bothered by the incident, although it's not appropriate for people to throw shoes at a press conference, at any leader." Perino suffered a bruised eye in the melee that followed the attack. "What happened to me was just an accident in the melee. It's not - I'm not bothered by it. It's not all that pretty," she said referring to her bruise, "but I'm not worried about it." Joyce reported that the law being used to prosecute al-Zeidi, and his possible sentence, are still unclear - as all the deliberations are taking place behind closed doors. Prosecutors have discussed trying him under a law, which dates back many years, that makes it illegal to assault a foreign leader in Iraq. That law could carry as much as a 15 year prison sentence, though legal analysts say that, because neither shoe actually hit Mr. Bush, that could be reduced to seven. Here's a closer look at that law from Joyce in another World Watch entry. The AP reported, however, that al-Zeidi could be charged with insulting a foreign leader, as opposed to assaulting one - a lesser crime that carries a possible two-year prison sentence. The case has riveted Iraq, with many in the country, and the wider Muslim world, considering him a hero for defying a president they blame for destroying the country. A shouting match Wednesday between parliament members for and against al-Zeidi prompted the speaker, Mahmoud al-Mashhadani, to announce he was resigning. Al-Mashhadani showed up at parliament on Thursday to resume his speaker duties. But so many lawmakers boycotted in protest of al-Mashhadani's outburst that the session was canceled. Al-Zeidi's action was broadcast repeatedly on television stations worldwide. State Department spokesman Sean McCormack suggested that incident was overblown. "We would hope that the fact of a U.S. president standing next to a freely elected prime minister of Iraq who just happens to be Shia, who is governing in a multi-confessional, multiethnic democracy in the heart of the Middle East, is not overshadowed by one incident like this," McCormack told reporters in Washington. McCormack said he believed that in the coming years, "the fact of the president making that visit under those circumstances will probably overshadow any memory of this particular gentleman and what he did." According to Iraq's constitution, President Jalal Talabani can issue a pardon if recommended by the prime minister, except under certain offenses including international crimes. That would enable the government to put an end to the affair without risking a backlash from al-Zeidi's admirers. Such pardons are ordinarily issued only after someone has been convicted. An investigating judge is studying whether there is enough evidence for a trial. Al-Maliki was standing next to Mr. Bush when the journalist threw his shoes and shouted at the American leader in Arabic, "This is your farewell kiss, you dog! This is from the widows, the orphans and those who were killed in Iraq." Al-Zeidi was tackled by Iraqi and U.S. security after throwing his shoes at Mr. Bush, who deftly ducked. A judge visited al-Zeidi in his jail cell this week and the family was told to return to court next week, according to Dhargham al-Zeidi. Dhargham al-Zeidi claims his brother was severely beaten after being taken into custody. However, Iraqi officials and another brother deny the journalist suffered severe injuries.